Population structure and genetic variability among seven groups of 44 parental lines of sorghum, including mid-season drought-tolerant, mid-season drought-susceptible, stay green lines, terminal drought-tolerant, saline-tolerant, saline-susceptible, high Fe–Zn lines and a wild genotype as an out-group were assessed using three dominant markers namely ISSR, RAPD, and DAMD. Wide range genome coverage of sorghum has been attained using these markers, which produced about 263 fragments of amplified products and the analysis accounted for a higher polymorphism (84.6%) and the polymorphic loci (72.65%) which produced a greater level of genetic distance among the genotypes. These findings are consistent with the UPGMA and neighbor-joining clustering of genotypes by individual markers. The existence of greater genetic variation at an intrapopulation level than at the interpopulation level was indicated by principal coordinate analysis and principal component analysis where the individuals of different groups failed to form distinct clusters rather mixed up along the axis. The Bayesian model-based structure analysis also identified the population structure with high admixture and diversity among the studied populations. The study also showed the non-existence of pure lines from this collection. Therefore, markers used in the study efficiently arrived at the phylogenetic relationships of 44 domesticated sorghum lines, and the obtained information can be implemented in breeding programs of this important food and forage resource for biofortification and the development of varieties with abiotic stress tolerance. Population structure analysis of 45 sorghum germplasm with various agronomic traits has been carried out which provides novel insights into understanding the genetic composition of sorghum collections for crop improvement solutions essential in rapid applications of plant breeding. The online version of this article ( https://doi.org/10.1007/s40011-019-01095-9) contains supplementary material, which is available to authorized users. One of the authors thanks the University Grants Commission, New Delhi, India for financial support in the form of UGC-BSR SRF (UGC Order No: F.25-1/2014-15 (BSR)/7-326/2011/BSR). 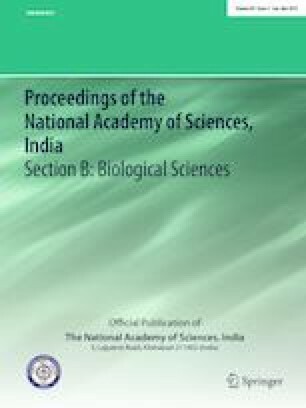 The authors thank Dr. Are Ashok Kumar, Sorghum Breeding, International Crops Research Institute from the Semi-Arid Tropics (ICRISAT), Hyderabad, India, and Department of Millets, Tamil Nadu Agricultural University (TNAU), Coimbatore, India, for providing the seed material used in this study. They sincerely acknowledge the Computational and Bioinformatics facility provided by the Alagappa University Bioinformatics Infrastructure Facility (funded by DBT, GOI; File No. BT/BI/25/012/2012,BIF). The authors also thankfully acknowledge RUSA 2.0 [F. 24-51/2014-U, Policy (TN Multi-Gen), Dept of Edn, GOI], DST-FIST (Grant No. SR/FST/LSI-639/2015(C)), UGC-SAP (Grant No. F.5-1/2018/DRS-II (SAP-II)) and DST-PURSE (Grant No. SR/PURSE Phase 2/38 (G)) for providing instrumentation facilities. The authors declare that they have no conflict of interest to publish this manuscript.